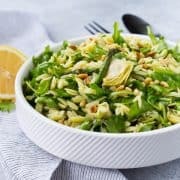 This spring orzo salad is full of bright and fresh flavors that will make you happy from the very first bite! Crisp asparagus, spicy arugula, and flavorful pine nuts are all dressed in a springy basil lemon vinaigrette. It’s a huge hit every time! 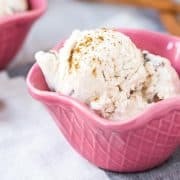 Make it for your next party, you won’t regret it! I made this spring orzo salad way back in December. Totally out of season at the time, but still completely delicious. If you remember, I talked about my cooking club in the past, and this was a recipe I made for our Christmas cooking club when we let the husbands tag along. Needless to say, it was a hit, along with all the other food the rest of the group made. No one cared that asparagus wasn’t in season at the time. They only cared about the fresh and bright flavors of this pasta salad. They cared about the peppery arugula, the salty artichokes, the irresistible pine nuts, and the bright citrus herb dressing. Or at least I’m guessing they did. I sure did! We had some leftovers of this salad after that night and it tasted fantastic leftover, too. I might have eaten it for breakfast. Ben always gives me the side-eye when I eat stuff like this for breakfast but I don’t let it stop me from living my best life. This is most definitely going to become one of my favorite pasta salads this summer, and I think you guys will love it just as much. When I was debating on what to title this recipe, I looked through my recipe archives at my other orzo salad recipes and it appears I have a problem. But if loving orzo salad is wrong, I don’t want to be right. We have Bruschetta Orzo Salad (another one of my faves! ), Creamy Southwestern Orzo Salad (this one is always a HUGE hit! 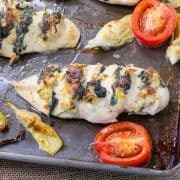 ), Orzo Salad Recipe with Yogurt Dill Dressing, Spinach Orzo Salad with Chicken Meatballs and Chickpeas, Orzo Salad with Watermelon, Feta, and Chicken, Orzo Salad with Chicken and Vegetables (this one uses a rotisserie chicken! ), and Greek Orzo Salad with Shrimp. 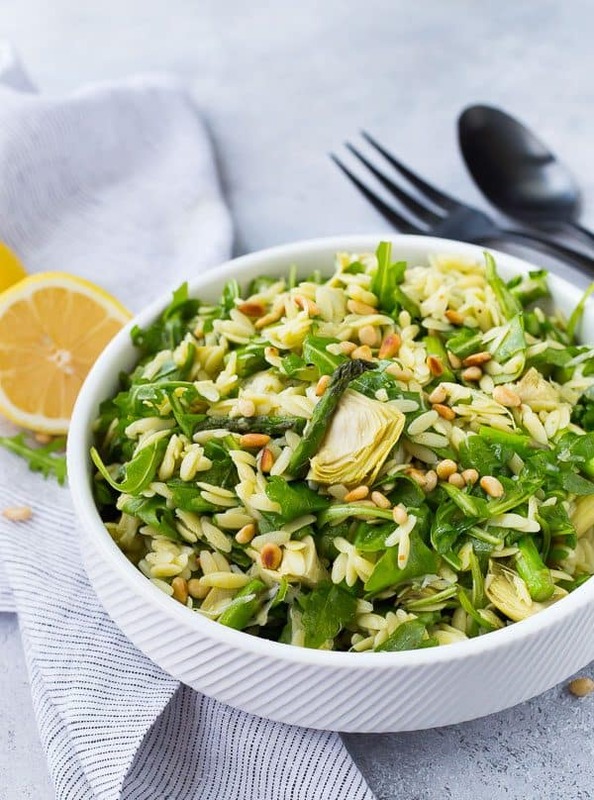 I love how orzo pasta fits right on your fork with whatever else may be in the salad – you always get a little bit of everything in one bite. However, if orzo isn’t your favorite or you don’t have it stocked in your pantry, you can always substitute with any pasta shape you’re smitten with. 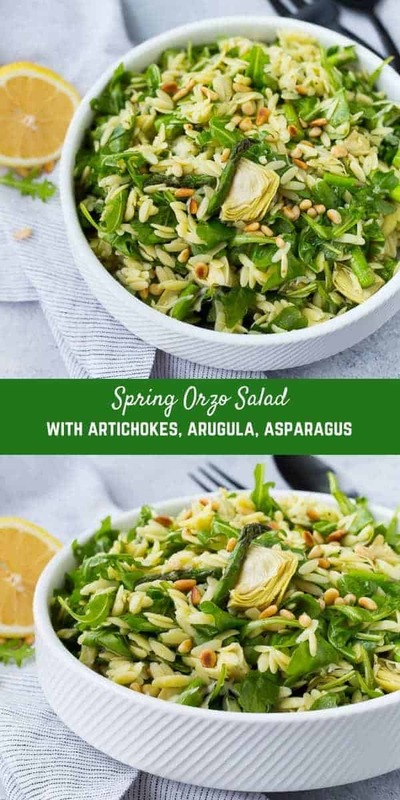 It’s definitely an area of this spring orzo salad recipe where there is some flexibility. 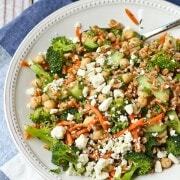 I led up to this recipe with a guide on how to toast pine nuts, as well as the dressing recipe I used in this recipe, a bright and tangy lemon basil vinaigrette dressing. It all comes together perfectly and I cannot wait to make this all spring and summer long! Buy artichokes that are packed in water – try to avoid the kind packed in oil or brine. Add pine nuts immediately prior to serving. This salad is best served immediately or within a few hour. It tastes great leftover, but the pine nuts do get a bit soggy and the arugula will wilt. Doesn’t stop me from eating the leftovers for a couple days, but you should be aware of it. 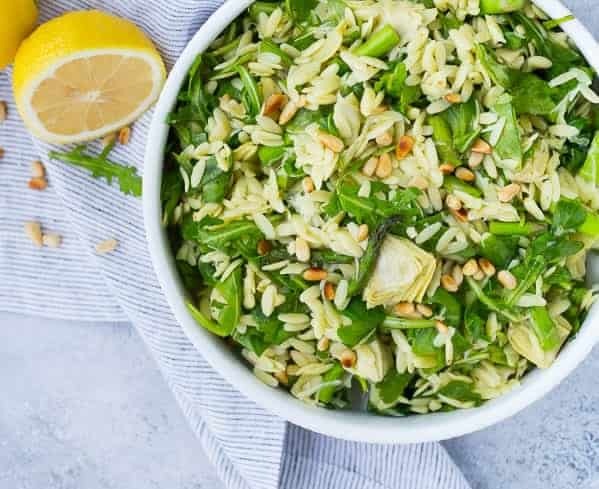 This spring orzo salad would be absolutely fantastic (like so, so, so good) topped with grilled chicken or grilled salmon for a complete summer meal! It would serve 4-6 if plated in this manner. 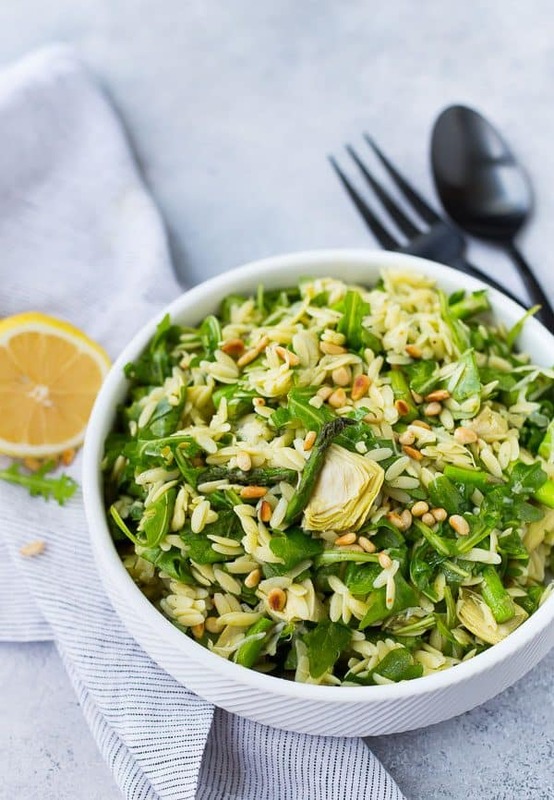 Make this spring Orzo Salad tonight! Bring a large pan of salted water to a boil. Add orzo and cook according to package directions. When cooked to al dente, drain and rinse with cold water until cool. Meanwhile, heat olive oil in a small frying pan over medium heat. Add asparagus and season with salt and pepper. Cook until bright green and tender but still crisp. Remove from heat. 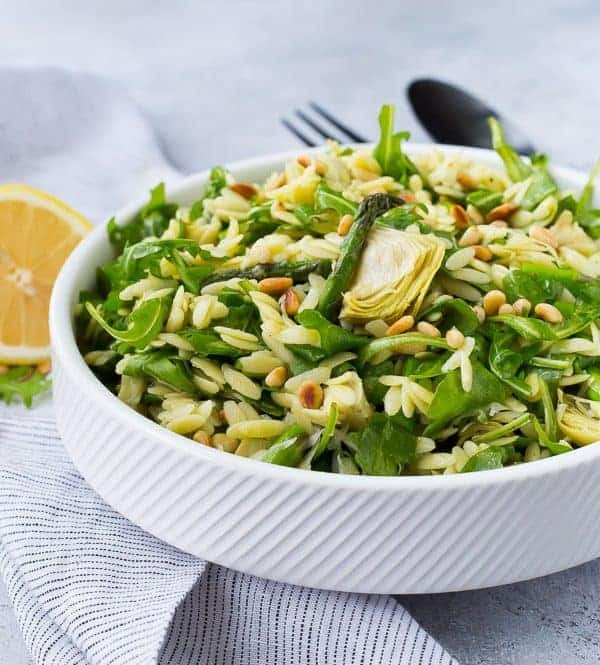 In a large bowl, combine the pasta, asparagus, artichoke hearts, arugula, Parmesan, pine nuts, and lemon basil vinaigrette. Stir to coat everything with the dressing. If not serving immediately, add pine nuts immediately before serving. I recommend artichoke hearts that are not marinated, but you may choose whatever you like. Verdict: This is officially my summer pasta salad. Husband’s take: Ben loves this salad and so do my friends! Changes I would make: None are necessary! If you’d like to swap out the asparagus, you could try fresh green beans. They’d be delicious in this. This looks so good. I’m terrible at spring cleaning. I can’t seem to actually get it all done, but we’re trying. Looks like making this may trump my cleaning list though. Ha-ha. I love this salad. I make a similar one with pepper and Parmesan cheese, sans asparagus all the time (once in a while with fresh cherry tomatoes). So easy healthy for a last minute side dish to like any meal. I’m so happy you like it! It’s one of my favorites. Happy spring! It really is! Thanks Denise!